The fundamental theory of poker was put forward by professional poker player David Sklansky in the popular poker strategy book The Theory of Poker . This particular poker theorem is different to the other ones described on this site, because it is a big general theorem as opposed to a smaller theorem that tells you what to do in X situation. Nonetheless, it is pretty straight forward, and it is a cornerstone of every winning poker player's game. Is the theorem still effective? No doubt about it; the fundamental theorem of poker always has been and always will be a concrete theorem in the world of poker. So there's no excuses for not learning this one. Explanation of the fundamental theorem of poker. This means that you would be playing the most profitable game of poker possible, as you are following the fundamental theorem of poker perfectly. Unfortunately however, the whole point of poker is that you are never 100% sure of what your opponent holds, which means that you are going to drift away from this perfect line of poker by not knowing the exact cards that each player has. So the key idea is to try and play poker as perfectly as possible even without being able to see other players' cards. In a nutshell, a winning poker player is a player that can play as closely to the way they would if they could see all of their opponents' cards. The more information that you can obtain from your opponent through reads and by analysing their betting patterns, the closer you will be able to play to this level and the more profitable your game will be. Example of the fundamental theorem of poker. A $1/$2 NL game and both players have $200 stacks. Let's say that we are last to act, and our opponent has bet $20 into a $20 pot on the flop. We can also see what cards our opponent is holding. Now, according to the fundamental theorem of poker, what should we do? Well, we have 3 possible options. Folding is out of the question, because we can see that we have the best hand. So we're down to either calling or raising. The best action here is to call. We can see that our opponent is making a pure bluff at this pot, so if we were to raise with by far the best hand here there is very little chance that our opponent is going to call and put more money in the pot. However, by calling we are giving our opponent the opportunity to put more money in on the turn by bluffing again. We stand to make more from the hand through deception, so calling has a greater expected value than raising. However, if we can see our opponent has a hand like A 2 for two-pair, raising would definitely be far more +EV than just calling. We can be very confident that our opponent will call a raise, so we can get a lot more value from the hand by raising with our strong hand rather than attempting to induce a bluff like we did in the last example. As you can see, knowing the exact 2 cards that our opponent is holding in each situation helps us to make the most profitable play possible. What's the use of the fundamental theorem? The most important idea is just to be aware of the theorem and try your best to follow it as closely as possible by analysing your opponents' plays and reading them as best as you can. The better your hand reading skills get, the closer you will be able to play according to the fundamental theorem and the more money you will make. You will not always be able to fill in all the gaps, but that is okay because neither will your opponents. But if you can build a greater understanding of the way they play and play more closely to the fundamental theorem of poker than they do, you will come out on top at the end of the day. 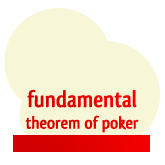 Overview of the fundamental theorem of poker. I think I just about covered all of what I wanted to say about the theorem in this article. The fundamental theorem is not a small theorem that points out a small aspect of the game, it is a whole new way of thinking and a way to approach the game. If you can play poker with the intention of playing as closely as you can to the way you would play if you could see all of your opponents' cards, you will do well. However, poker is poker because you are never fully aware of what the other player holds. All of the strategy articles on Texas Hold'em and on any other poker variant basically tries to help you play as closely to the fundamental theorem of poker based on the limited information that you have on your opponents.